The 20th anniversary of the establishment of diplomatic relations between Eritrea and the People’s Republic of China (PRC) was commemorated yesterday at the Chinese Embassy in the presence of President Isaias Afwerki, senior Eritrean government and PFDJ officials, as well as invited guests. Speaking on the occasion, the Chinese Ambassador to Eritrea, Mr. Niu Qing, said that the similarity of both countries in terms of culture and historical background has enabled them to foster diplomatic ties based on mutual respect and partnership. He further pointed out that the development programs jointly accomplished in Eritrea over the past 20 years in the domains of infrastructure, education, health, mining and others attest to this. Also speaking at the ceremony, Ambassador Fisehatsion Petros, Head of Desks in the Foreign Ministry, gave briefings regarding the achievements registered in relations between the two countries in the social, cultural, economic, political and other spheres, in addition to the growing bilateral ties. Likewise, Mr. Abraham Dawit, Director of the Asia-Pacific Desk in the Ministry, stated that both countries share common experience in their armed struggle for independence and the pursuit of an independent policy, and that such common attributes have had positive impact in their diplomatic ties. Moreover, he explained that current investment prospects in Eritrea are expected to further relations of partnership between both nations. During the occasion, the Chinese Embassy presented souvenir to President Isaias Afwerki. It is to be recalled that diplomatic ties between Eritrea and the PRC was established in 1993 following the declaration of the outcome of the Eritrean Referendum. Asmara, 18 May 2013 – President Isaias Afwerki and the Chinese leader, Mr. Xi Jinping, exchanged solidarity messages in connection with the 20th anniversary of the establishment of diplomatic relations between Eritrea and the People’s Republic of China (PRC). In their respective messages, the two leaders said that the similarity of both countries in terms of societal values and historical background was a springboard to fostering diplomatic ties over the past 20 years. They also disclosed the readiness of both sides towards reinforcing bilateral ties. Likewise, Foreign Minister Osman Saleh and his Chinese counterpart, Mr. Wang Yi, exchanged similar messages. 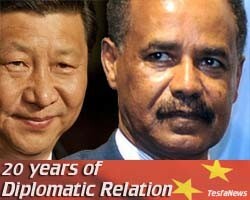 It is to be recalled that Eritrea and the PRC established diplomatic relations in 1993.